It was this post in particular that caught my eye lately, and stirred my disapproval of what I used once to think. To save you clicking on it, I had tried to answer the question “What is poetry?” and arrived at the conclusion that whereas prose is writing in units of sentences, poetry is writing in units of lines that may cut across sentences. And there I left it. I suppose that is right as far as it goes, but it goes nowhere near far enough. For it does not address the question of why we may think of certain passages of prose – in units of sentences, as specified –as nonetheless poetic. No, there’s something more to it than this. I’m not entirely sure what, but let us try, in the spirit of enquiry, to see if we can at least come close to an answer. The first question that occurs to me is: Why write in units of lines anyway when writing in units if sentences makes so much more sense? The answer to that is, I suppose, that by writing in units of lines, the rhythm of each individual line becomes more prominent, and the words placed at the start and at the end of each line are given greater weight. And if we further ask why the rhythm of individual lines should matter, or why we should wish to give greater weight to certain words, the answer surely is not merely expressivity, but, more fully, an expressivity that prose, written in units of sentences, cannot usually give us. Poetry is writing in which language is manipulated in such a way as it make it express things that, were it not for this manipulation, it would not be able to express. By this definition, the third chapter of Joyce’s Ulysses is pure poetry; and my broken-up piece of prose above (which I nonetheless insist is far more poetic than much that passes for poetry on the net these days) isn’t. And so on. There are many, many more modes of manipulation – as many as there are poets to imagine them. And the purpose of all this manipulation is to force language to yield meanings that it would not have been able to yield were it restricted merely to dictionary definitions of words. Indeed, in poetry, the dictionary definitions are sometimes the least important elements. It is not to decry analysis to say that a poem can bypass analysis, or even thought about the literal meanings, to make its effect on the reader. After one of Don Quixote’s many misadventures, Sancho Panza refers to his master’s “triste figura”. And indeed, his master has been knocked about a fair bit: “triste figura” is a reasonable way to describe his face. Don Quixote however seizes on this: the term “triste figura” clearly means more to him that it does to Sancho, and he determines henceforth to be known as “El Caballero de la Triste Figura”. What was no more than a literal description on Sancho’s part acquires far greater resonance for no better reason than that Don Quixote demands it should. And in a way, this is emblematic of the entire novel. The idea of a man living in unremarkable contemporary times, but imagining himself a knight errant, and mistaking the ordinariness around him for the extraordinariness of magical tales, seems no more than the material for a short comic sketch; but Cervantes makes of this seemingly slim material two substantial novels, published ten years apart, and, together, taking up nearly a thousand closely-printed pages in my Penguin Classics edition. These two novels, taken together (as they usually are), have come to be seen as one of the major cornerstones of Western literature; it has become a myth far more potent than the myths it had initially set out to debunk, and which are now largely forgotten; it resonates in our minds because, just as Cervantes’ creation had demanded that the simple literal description “triste figura” be seen as signifying far more than merely its literal meaning, so Cervantes himself insists that this material for a brief comic sketch be seen as something far, far more significant than what it may at first sight seem. Previous generations of translators had rendered “triste figura” as “doleful visage” or “sorrowful countenance”, or some other sonorous expressions that could never have occurred to the illiterate peasant Sancho. John Rutherford translates it more credibly as “sorry face”. (Edith Grossman prefers “sad face”, but they were both thinking along similar lines.) The whole point is the transformation – the transformation of something simple to something big: if the English rendition of “triste figura” is big-sounding in the first place, there is no transformation to be achieved. However, a transformation does happen, and here, there really is a sort of magic involved. As the simple expression “triste figura” becomes transformed, at Don Quixote’s insistence, into something far more resonant and far more profound, so the novel itself transforms from a mere idea of a comic sketch into something far bigger, and far more magnificent. But what it transforms into remains, I think, elusive. We can get the obvious things out of the way: yes, everyday life is dull, mean, and often sordid, and there seems little or nothing in it to warrant descriptions such as “glorious” or as “beautiful”; that Don Quixote’s madness, while obviously denying reality, is replacing it with a vision of life which, though unreal, is nonetheless noble and beautiful; and that the beauty of Don Quixote’s vision is often cruelly deflated by the reality, and that’s comic; but, at the same time, it often transcends reality by being more noble and more beautiful, and that’s sublime; and that the greatness of Cervantes’ achievement is not seeing it as one or the other, but as both – as crude and comic, and, at the same time, as resplendent and sublime. So far, so obvious. But what I find fascinating is the question of why this particular fusion of opposites should resonate over the centuries so powerfully in our collective consciousness. I doubt Cervantes knew himself why this story of a man choosing to become insane without a cause should resonate so powerfully: possibly, when he started, he had no thought of it being anything other than a mere comic sketch. But if that were indeed the case, he must have realised quite early on that he had struck gold, for he does not end his story after the first few chapters, as he could so easily have done. Instead, he decides to continue the story – and not merely with Quixote at the centre: this Don Quixote needed a companion – a servant who complements his master’s madness. The obvious thing to do is to present Don Quixote as completely mad, and given over to fantasy, and his servant as the realist, but that is too crude and too schematic for Cervantes’ purposes: for Don Quixote is frequently intelligent and perceptive, and Sancho, although he can see windmills for what they are rather than as giants, and can see sheep but as sheep rather than as armies, is nonetheless caught up to such an extent in his master’s madness that he half believes it. And when his master promises him governorship of an island, Sancho’s cupidity leads him frequently to suspend his scepticism. At one point, when he thinks the island he will govern will be populated by black people, Sancho goes so far as to speculate on how much he will make if he were to sell them all into slavery. I cannot remember from my earlier readings how Sancho is developed in the second part, but in the first part, at least, Sancho contrasts with Don Quixote not so much in terms of his being a realist to Don Quixote’s fantasist, but, rather, in his being greedy, credulous, and cowardly, while, in comparison, his master remains idealist, noble, and courageous. Indeed, Sancho here is redeemed only by his loyalty to, and genuine affection for, his master. I do get the impression, though, that Cervantes wasn’t as sure with this material here as he was in the second part, published ten years after. Oh – there are wonderful things here, certainly: the famous fight with the windmills, the attack on the sheep, the deliberate madness (for no cause) and the penance (for no sin) in the Sierra Morena, and so on. But there are also interpolated stories that are frankly tedious. The Captive’s Tale at least has the merit of being an exciting adventure story of imprisonment and escape – and is also surprisingly sympathetic in its depiction of the mental torment of a Moor whose daughter forsakes her father’s religion; but good adventure stories are frankly two a penny: why Cervantes should wish to hold back the far more interesting tale of Don Quixote and Sancho Panza in order to give us a mere adventure story is anyone’s guess. And as for the other tales – the dull and psychologically dubious tale dubbed (in Rutherford’s translation) “The Tale of Inappropriate Curiosity”; and the even duller and even more psychologically dubious tale of Cardenio, Dorothea et al that is embedded into the main storyline itself – the less said about them the better. These are things we patiently read through because we know there are wonders yet to come; or, better still perhaps, these are chapters we skip over. I can only conjecture that Cervantes was padding his novel out with such material because he wasn’t as yet fully confident of doing full justice to the story he had broached of Don Quixote and Sancho Panza: at the very least, it is surely significant that there are no such interpolated stories in the second part, where Cervantes seemed surer of his material. Similarly with his conceit that he is narrating to us a story originally written in Arabic by a Moorish author Cide Hamete Benengeli, and that he, Cervantes, had chanced across this manuscript by accident in the market. In the eighth chapter of the first part (the one that starts with the now mythical attack on the windmills), Cervantes sets up a fight between Don Quixote and a Basque; and, just as the fight is about to commence, he tells us that he cannot narrate what happens next, as the manuscript he had been transcribing for us stops at this point. It’s a wonderful gag – of a kind we’d dub “post-modernist” or something similar – but, having introduced this conceit, Cervantes rather surprisingly does not refer to it again. As I remember from my previous readings, he has great fun with it in the second part, but I can’t help wondering whether his reticence on this matter in the first part is a consequence of his not yet having absorbed fully the implications of what he has created, and, further, being aware of the fact that there’s more there than he could immediately do justice to. All this may give the impression of the first part of the novel being, in effect, a trial run for the more accomplished second part. That would certainly be unfair, because, if we were to ignore the tedious interpolations, what we have is clearly a work of genius. The genius lies not merely in the creation of Don Quixote and of Sancho Panza, but also in the realisation of their potential: it is a genius that recognises how powerfully the fusion of knockabout comedy with sublimity could resonate in the human mind, how a deliberate rejection of reality can appear simultaneously elevated and absurd. But I do, I admit, find it hard to resist the impression that Cervantes knew he would have to let the implications of his creations sink more deeply into his own mind before he could do them full justice; and that a second part would be called for once they have sunk in to a sufficient depth. At the end of the first part, Don Quixote is brought back home in a cage, but Cervantes promises us there will be further adventures. There is more to El Caballero de la Triste Figura, the Knight of the Sorry Face, than has so far been apparent. Many questions remain unanswered. of which the most intriguing, for me at any rate, is: why is the Knight so sad? What great sadness of the world has he taken on? For there is, undoubtedly, a very great sadness amidst all the laughs (and Rutherford’s translation is frequently laugh-out-loud funny): Dostoyevsky famously referred to it once as the “saddest book ever written”. Does the sadness lie in the fact that the denial of reality is but a madness, and cannot be otherwise? Possibly. The ultimate reality, after all, is death: that is what we all inevitably come to. That this ultimate reality claims us all, no matter how madly we may wish to deny it, is indeed a source of infinite sadness. Anticipating somewhat, this is where the second part eventually leads us – that Ultimate Reality that cannot be gainsaid. But before then, there are many adventures yet to come for the Knight of the Sorry Face. When well-known books are adapted for the screen, there’s always wailing and gnashing of teeth from aficionados of the book about the liberties taken. I am quite relaxed on this matter: no film has any obligation, as far as I’m concerned, to be respectful to the original source material, and, however inept the film may be in comparison to the book, the book itself will not cease to be. And if people who have not read the book mistake what they see on screen to be an accurate reflection of what is in the book, then they are welcome to do so. But this latest proposal attracted my attention. I realise it is still in the early stages, and may never even get made, but I do hope it does. It is a proposed adaptation – the word must be used loosely – of Dante’s Inferno, no less. In this version, “Dante descends through the nine circles of hell to save the woman he loves”. What larks! Bring it on, say I! I already sitting here waiting with my popcorn and fizzy drink! The following is a not really a review – I don’t really do reviews, as such! – it’s more an attempt to make sense of various thoughts that struck me on seeing The Royal Shakespeare Company’s production of Shakespeare’s Othello from the Royal Shakespeare Theatre, Stratford-on-Avon, directed by Iqbal Khan. I saw it as a live cinema broadcast on August 26th, 2015. But more recent Othellos tend to eschew this kind of approach: instead of the sonorous grandeur that actors of a previous generation had found, modern Othellos tend to break these lines up into shorter units, preferring staccato rhythms to long legato lines. The effect is to diminish, or even to deny altogether, the sense of nobility in the character. I suppose this reflects in part a modern sensibility that is sceptical of the very idea of nobility or of sweetness: actors do not generally depict Hamlet as a “sweet prince” either these days. But I wonder to what extent this harsher, and, some would say, less sentimental view of Othello – both of character and of play – is informed by the well-known 1952 essay by F. R. Leavis, “Diabolic Intellect and the Noble Hero” (included in this collection), in which it is argued with considerable vigour that Othello, far from being the noble and dignified protagonist that A. C. Bradley had described in his famous study, is actually a most ignoble and, indeed, shallow personage, vain and self-dramatising, unworthy of Desdemona, and unable, given his shortness of vision and triviality of mind, even to come close to appreciating her worth. Bradley is very much Leavis’ target in this essay, and in every way, Leavis seems Bradley’s opposite: where Bradley is gentlemanly and charming, Leavis is abrasive, relishing a trenchant and quite wicked vituperative wit. And where Bradley tries to find the best he can in the characters, Leavis only sees characters who are morally short-sighted, blinkered, self-serving, and most ignoble. There are two main points in which Leavis takes issue with Bradley: firstly, he rubbishes Bradley’s contention that it is really Iago who is at the centre of the play; and secondly, he rips to shreds – with some gusto – the idea that Othello possesses even the slightest hint of nobility or of dignity. On the first point, I agree with Leavis whole-heartedly: Iago certainly has more lines than Othello, but this hollow, pathetic shell of a man, lacking as he does anything of Macbeth’s pained consciousness of the damnation of his soul – lacking consciousness even of the existence of a soul that may be damned – simply does not have enough substance to hold the centre of so immense a tragic work. But Leavis’ second point – that Othello is similarly hollow – I find more troubling. If the drama is essentially that of an empty eggshell cracked open revealed its emptiness, then why does it grip so powerfully? Why is it that by the end of a reading, or of a good performance, we feel that we have glimpsed into the very depths of the human soul? It is a marvellously sure and adroit piece of workmanship; though closely related to that judgement is the further one that, with all its brilliance and poignancy, it comes below Shakespeare’s supreme – his very greatest – works. I couldn’t help feeling when I first read this essay that, given Leavis’ view of the character of Othello, his judgement on the play could not be otherwise – that the mere cracking open of an empty shell to display the emptiness is not and cannot be the stuff of supreme masterpieces. But since it does seem to me self-evidently a supreme masterpiece, it must surely follow that there are flaws in Leavis’ arguments. However, what is remarkable is that even when Othello is played as Leavis had seen him (Antony Hopkins’ interpretation in the 1981 BBC production strikes me as very Leavisite in conception), the drama retains still its extraordinary power. In other words, Leavis’ conclusion is not inevitable, even if we were to accept his arguments: Othello himself can be hollow and empty, lacking in nobility or in majesty, but the tragic power of the drama, even from this Leavisite perspective, somehow remains undiminished. And it is worth investigating where this tragic power lies: if it is not in the depiction of the great fall of a great man – since Othello is not great here to begin with – where is it? My own view of the play – an interpretation that for many years has satisfied me, and which continues, despite Leavis, to satisfy – I tried to describe here, and there’s little point my repeating it; however, Leavis’ view is certainly worth considering, not merely because he was among the most perceptive of literary critics both of his or of any other generation, but also because his interpretation is coherent, and entirely consistent with Shakespeare’s text. But it does leave us with an enigma: a drama that, on the surface, should really be quite trivial – the exposure of a hollow man as but a hollow man – turns out to be gut-wrenchingly intense. How can this be? This latest RSC production is Leavisite in many ways. Othello, played by Hugh Quarshie, is allowed little of the nobility and majesty that I remember from Donald Sinden’s performance of the late 70s, or is apparent in the thrilling performance by Richard Johnson in an audio recording from the 60s. This lack of nobility is clearly a conscious decision, since Quarshie, given his stage presence and charisma, his superb verse-speaking, and, not least, his imposing and sonorous voice, is certainly more than capable of depicting nobility had he so wanted. But this Othello is far from noble: we see him happy to oversee torture of prisoners as a routine part of his job; and, right from the start, he seems to express little sense of wonder that Desdemona had chosen him: he takes it all in his stride, as if all this were no more than his due. He is a supremely confident man, well aware that he can flout the authority even of a Venetian senator with impunity, and unsurprised that so valuable a prize as Desdemona – for prize is how he seems to consider her – could fall to him. All this is in Shakespeare’s text: seeing Othello in such Leavisite terms is a valid interpretation of the text, and not an imposition. And, somewhat unexpectedly and very disconcertingly, it seems to point to certain parallels between Othello and Iago. These parallels are reinforced in this adaptation, as Iago here is also played by a black actor – Lucian Msamati. This casting removes – to a certain extent, at least – racism from Iago’s motivation, but what it substitutes in its place is most disturbing: for if it is true that Iago manages to bring down Othello to his own bestial level, the journey Othello makes is not a very long one; the implication seems inescapable that Othello, even from the start, is no stranger to Iago’s mindset. The use of the word “again” seems to imply that Othello is no stranger to “chaos”: for all his seeming confidence in the affairs of men, in other matters, he knows how precariously balanced his soul is between redemption and perdition. And here, I think, we see a very significant difference between the two – a difference that Leavis does not comment upon: where Iago wishes to destroy that quality which he knows he lacks – that “daily beauty” – Othello craves it, for he sees it as a path towards redemption. And this, I think, is what gives the play its gut-wrenching tragic power: even if Othello were to be everything Leavis claims he is, he seeks redemption: Iago doesn’t. Iago, working by “wit and not by witchcraft”, cannot bring himself even to believe in such a thing. If I am on the right track on this, the tragedy lies not in Othello’s fall from a great height, but in his failure to reach that height in the first place. That height may be but vaguely glimpsed, but Othello, unlike Iago, is capable of glimpsing it, however vaguely, and the entire play seems suffused with a terror of that chaos that lies just under the surface of our lives – a chaos that prevents us from attaining those vaguely glimpsed heights, and which instead hurls our very souls from heaven. This latest RSC production certainly captures that sense of terror. Othello as a play is curiously paced: the tempo seems quite slow for the first half, and, given that the play is most famous for its depiction of jealousy, Othello doesn’t even start to be jealous till after the half-way mark. But once it starts to grip – somewhere in the middle of Act 3, as Iago starts applying his poison – it doesn’t let go: even the “Willow song” scene, as Emilia prepares Desdemona for bed (IV,iii), where Shakespeare gives us something of a calm before the final storm, the air is thick with menace and with forebodings of impending doom. Perhaps no other play by Shakespeare, not even King Lear, leaves us quite so emotionally drained as does this. 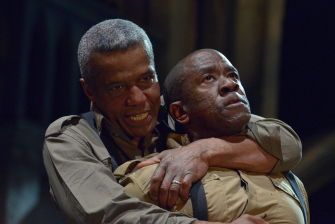 It is Iago rather than Othello who commands centre stage for most of that first half, and Lucian Msamati gives a quite extraordinary performance here of a man who is, psychologically, deeply damaged. Some actors present Iago as a sort of likable villain, but Msamati’s Iago is, from the beginning, a dangerous sociopath. There is a powerful scene in the fourth act in which Desdemona, in her innocence and naivety, turns to Iago for help; and in this production, she kisses Iago in gratitude for what she thinks is his good advice. The sheer sense of physical revulsion with which Iago reacts to this kiss is startling. This is a man who finds the whole of humanity disgusting – he is obsessively cleaning up after everyone, as if the very physical presence of others is to him an abomination. In the text, we clearly see Iago making up his plot as he is going along, and I have long thought that Iago engineers the destruction of Othello and of Desdemona only because, having underestimated the violence of Othello’s reaction, he is forced into doing so; but here, Iago wills the destruction from the start: it is merely the mechanism of his plot rather than its end that he has to improvise. Far from being a likable villain, this is an Iago whose very presence makes one’s skin crawl. Quarshie’s Othello, as we first see him, is a man who is, seemingly, supremely confident. But Iago understands his weakness. He may not understand what Othello is aspiring towards, or why, but he is as aware as Othello is of the chaos that lies just below the surface, and he is aware of it because, in this, Othello resembles himself. And Othello’s surface cracks very quickly indeed. When Othello exits some half way through III,iii – the great scene in which Iago starts to apply his poison – he is perturbed, yes, but still in control of himself; but when he re-appears later in the scene, he is a raging maniac. This bipolar nature is, admittedly, written into the text itself, but I don’t think I’ve seen any actor emphasise this to the extent that Quarshie does. Desdemona is one of Shakespeare’s most thankless roles. I think Shakespeare did depict a real flesh-and-blood woman rather than merely a symbol, but there seems little for the actress to do other than display vulnerability and bewilderment. By the end, of course, she proves herself saintly, as she miraculously forgives Othello seemingly from beyond death itself, but on the path to that ending there seems little scope for the actor playing Desdemona to make her mark. Joanna Vanderham does a fine job – at times going so far as to display resentment – but in terms of stage presence, Othello and Iago are too powerful to be easily removed from the centre. The “Willow song” scene – that calm before the storm that is nonetheless saturated with such deep foreboding – is particularly effective, with Ayesha Dharker a most effective Emilia. Not that the production is beyond criticism. I regretted in particular the excision of Iago’s improvised cynical rhymes in II,i: presumably they were removed because they show Iago as too sociable a figure, but it would have been interesting to see how they might have fitted with Lucian Msamati’s interpretation. But the biggest misjudgement came, I think, in the later scene in which Cassio becomes drunk while on guard duty. Here. Iago’s song is replaced with a sort of karaoke scene, in which the soldiers improvise rhymes to each other. While most productions can get away with a bit of judicious cutting, it is never advisable to add lines to Shakespeare’s text, as the added lines are bound to suffer in comparison with what is around it. This is especially the case when the added lines are merely trivial doggerel, as they are here. Further, these lines indicate racial tensions amongst the soldiers, and there seems little point introducing such a theme in a play that gives no scope to develop it. The audience is simply left wondering what purpose this scene serves. When, shortly afterwards, we see Othello supervising the torture of a prisoner, hooded and terrified, that seemed to me at first also to be a misjudgement – a fashionable reference to current world events that does little to advance the drama. But I was mistaken in this: this torture scene does actually fit into the overall concept of this production: such torture does take place in military bases, after all, and, since this Othello is not the majestic and noble figure that Bradley had envisaged, it is not amiss to see something of the brutal world with which he is so familiar. And in any case, torture is central to the play: Iago tortures Othello; Othello, in turn, tortures Desdemona (and, one may argue, himself); and at the end, once Iago’s villainies are exposed, Iago is threatened with actual physical torture. When Othello re-emerges in III,iii, raving like a maniac, he ties Iago to a chair that had previously been used for torture, and threatens to torture Iago physically even as Iago continues to torture him mentally: it is a scene of powerful theatricality. The only point that I’d take issue with is the appearance of Desdemona on stage even as the torture victim is still present. Now, given the conventions of the theatre, it is entirely possible for two people to be on stage together, and yet be in different places, so it is not necessarily the case that Desdemona sees the torture victim, or even that she is aware of the torture; but having them both on stage at the same time does inevitably implicate Desdemona in the torture, and that is surely a mistake. So it’s not a flawless production by any means; but once it starts to exert its grip, it doesn’t falter. It demonstrates once again that a Leavisite view of Othello does not diminish the tragic greatness of the drama, but merely shifts its focus: the awe and the terror we experience are not occasioned by the fall of a Great Man, but springs, rather, from an awareness of the horror and of the chaos that lie immediately below the seemingly civilised surfaces of our human lives. However we view Othello, however we view its central character (who is most certainly Othello himself, and not Iago, as some still continue to insist), there is no other drama, except perhaps Sophocles’ Oedipus, that is quite so gut-wrenching in its effect.